My guess was it is not video RAM related, but probably RF module fault. 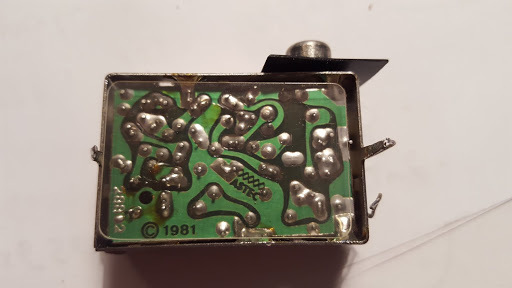 First decided to change all electrolytic caps on the board and see if it helps – it did not. Picture was the same. Then decided to check RF module – remove it and re solder all joints. And then it came to my mind a thought about why the hell I am using this RF module at all. I could just do a composite mod and that would definitely would solve all RF related video problems. 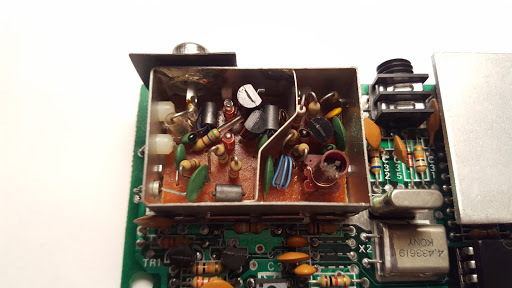 Composite mod as it is called, is just disconnecting power and signal wires that go from RF module – means disconnecting RF module. 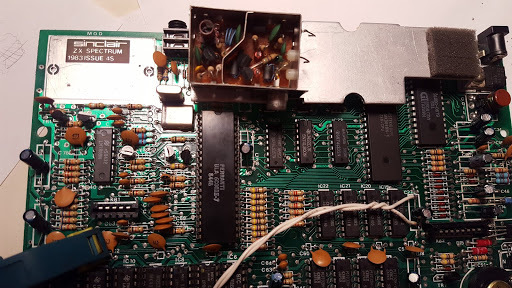 Then, in the RF module itself, disconnecting resistor from video output connector. 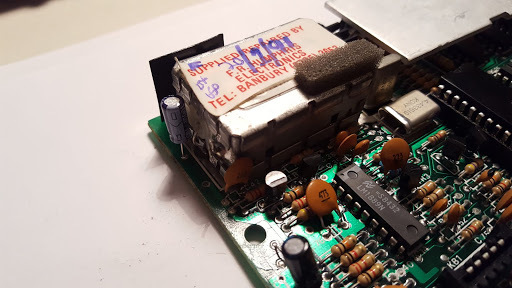 And finally, connecting video output from board to video output connector in RF module using 100uF 10v electrolytic capacitor ( negative to the board, positive to video output ). 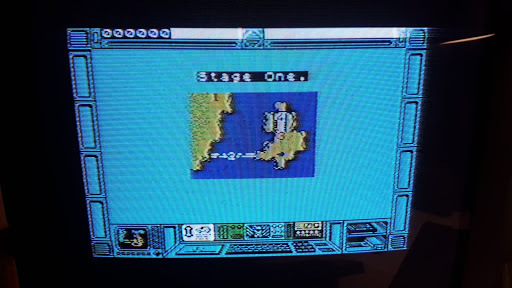 That`s it, did those changes, connected to TV`s composite video input and got clear picture without any RF glitches. Another was ZX Spectrum+ 48K (s/n S01-135100). After turning it on could not see clear image (sorry did not take image of that picture). 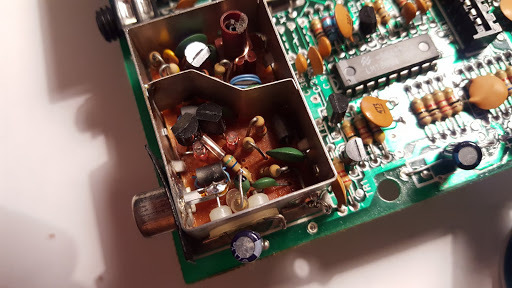 When I disassembled this device I found that it already had some changes, lower RAM chips were not original, it had some jumper wires soldered on PCB, transistor TR4 seemed like already replaced (at least someone did some soldering with it). Expecting the worst I started to check voltages (using this guide) and noticed that 12V is missing on lower RAM chips. When checked transistors TR5 and TR4 found that TR4 is most probably faulty. TR4 ZTX650 can be replaced with 2SD1207. TR5 ZTX 213 can be replaced with 2SA733 ( or BC212, BC257, BC307, BC557). 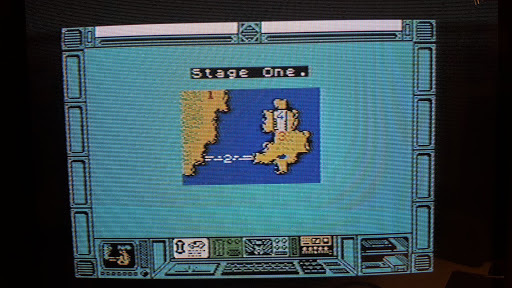 But good thing is that it was already overlooked by ZX Spectrum PCB designers and it had holes for alternative pinout transistor near the original one ( see photo ). Voltages immediately changed to correct ones. After powering it up it started nicely. Whoohoo, it was an easy fix. *One interesting thing is that on the back of ZX Spectrum case there was a sticker with text: 31.7.86 RR 47293 C.DAVIES. Not sure what does it mean, maybe information about performed repair or previous owner.